The annual Delta Fair picked up where the Mid-South Fair left off. Expect a solid week of rides, midway games, live music, exhibits, livestock and – my favorite event – pig wrastlin' (their spelling, not mine). For a full schedule of Delta Fair events and specials, go here. For years, some of us have been championing the idea of turning Sept. 1st (aka, 901) into a citywide, hater-free Memphis holiday. This year, it's going to happen. The first annual 901 Day is a celebration of what it means to be in Memphis. There are events all over the city (think concerts, pop-up shops, parties, etc.) that all are welcome to attend. Or, you can host your own event – just make sure to let the 901 Day crew know about it. The only limits are your imagination and the law. In the past six years, the Church Health Center's annual benefit has grown from a single concert to a four-day long music festival featuring some of Memphis' best bands. This year, there are two new, free all-ages events – a daytime street fair in Overton Square and a Sunday night show at the Levitt Shell featuring Booker T. Jones (as in, of the MGs). Millington's annual celebration of the noble goat includes vendors, demonstrations, a petting zoo, goat chariot races and more. There used to be an anvil shooting contest, but it seems to have been discontinued. Alas. Admission is free, but bring some cash – parking is $5. I’ve got four words for you: running of the weenies. The annual weenie dog race is possibly the silliest event at the Germantown Festival, but definitely not the only one. Expect about 400 arts and crafts vendors, live music, classic cars and games at the two-day festival. 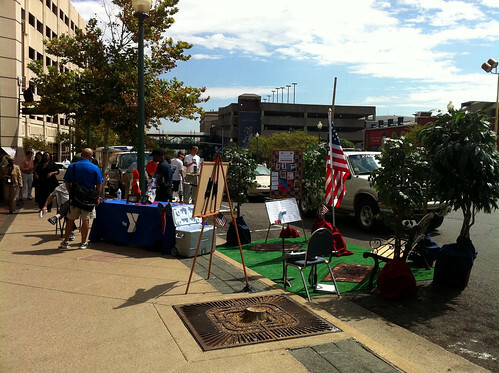 On Park(ing) day, Memphians are invited to turn downtown parking spaces into miniatures public theme parks. Last year, there were seesaws, libraries, teepees and a miniature roller derby track. The Friday afternoon festival runs along Peabody from Front to Second St. If you're in need of some small-town charm, the annual Cordova Festival is a good place to get it. The small but bustling community festival features vendors, arts and crafts, museum tours, kids' activities and tons of food. Ahoy, mateys – the Mid-South Pyrate Faire is returning to Mud Island on Sept. 28 – 30. Expect lots of family friendly swashbucking good times – costume contests, a pirate ship, the Pyrate's Ball, fire dancing, live music, arts and crafts, vendors and the return of the sea shanty sing along. The first-ever Best Memphis Burger Festival is happening at Minglewood Hall on Sept. 30. Cooking teams will be competing for burger glory. While you can't eat whole burgers from the competing team booths, some will be exchanging samples for donations to Mid-South Spay and Neuter Services. There will also be live music, competitions, food trucks and pet adoptions. If you've got something metal that needs a little love, bring it to the National Ornamental Metal Museum's annual fix-it festival. During Repair Days, the museum's blacksmiths will work on whatever you've got. While you’re there, check out the hands-on activities, blacksmithing demos, museum exhibits and auction. It’s free to get into the festival, but any work will be at a fee. The annual Mid-South Pride Festival and Parade is the biggest LGBT pride event in Tennessee with tons of vendors, bands, speakers, food and a parade through downtown Memphis. The festival starts at 10 a.m. in Robert Church Park and the parade steps off from Fourth and Beale St. at 4 p.m. The 40th annual Pink Palace Crafts fair is three days of artisan demonstrations (in everything from candle making to metal tinkering), kids' activities, eating and shopping at booths run by artists and craftspeople from around the country. Proceeds benefit the Pink Palace Museum. During River Arts Fest, hundreds of local and national artists, bands and vendors invade the South Main Arts District for a three-day street festival. There's live music, plenty of food, hands-on art stations and live artist demonstrations. This year, admission to the festival is $5. The Indie Memphis Film Festival is four days of feature films, documentaries, shorts and music videos from the Mid-South and around the world. You can purchase a full festival pass or tickets to individual shows, but make sure you get your tickets to the bigger featured screenings early – they tend to fill up fast. Memphis' Indian community takes over the Agricenter for their annual celebration of Indian culture. During the day-long festival, you can learn about Indian history and culture, watch (or participate in) traditional dances, shop at the bazaar, get henna body art and sample all kinds of tasty food on the cheap. The Memphis Comic and Fantasy Convention is three glorious days of geekery. There will be panels, gaming, costumes (and a costume contest), visiting artists and writers, and, according to the sidebar on their website, "There Will Be Steampunk"
Know of a fall festival that I left off? Leave it in the comments and I'll get it added to the list. Thanks for the compiled list, didn't realize there were so many events in the fall. Oct. 20th is National Archaeology Day and Chucalissa plans to do it big. I will contact you with more information when we cement plans. Sept 7 is the Dixon Gallery's Art on Tap beer event. Tickets last year were $75 BUT unlike ZooBrew (which is Sept 30 btw) price of a ticket includes food. The Memphis Mummies 3rd Annual "Run to The Sun" motorcycle ride all proceeds for LeBonhouer Children's Hospital. Please don't leave this off your list again this year.